Sometimes I feel like the pantomime villain at the RBC Film Club or perhaps it’s just that I’m one of those people that does not see the Emperors new clothes? 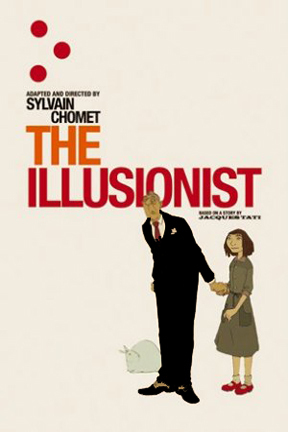 I sure that everyone that see’s The Illusionist (2010) would not dispute the technical brilliance of Sylvain Chomet beautifully hand drawn animated movie but the question remands does it entertain? Its 1959, aging magician Tatischeff is fighting a losing battle attempting to earn a living in Paris as a vaudeville artist performing for any one that will hire him. He tries his luck in London where he is upstaged by a rock n roll band. A chance encounter with a drunken Scotsman leads to an engagement in a village pub off the west coast of Scotland. Its here he meets the young skivvy Alice who becomes enchanted by this father figure and follows him to Edinburgh. In Edinburgh Tatischeff takes various jobs, Alice divides the old man from his meagre earnings and we witness the demise of the music hall along with the vaudeville artist. Back to my question does it entertainment? Cards on the table! I’m not a fan of Jacques Tati and of course I realise that this film was based on the unfinished screenplay by Tati adapted by Chomet. I’m sorry to say that this disconcerting viewer did not appreciate the humour in this film. The grunts and groans that passed as dialogue were irritating; the film was twenty minutes to long, its pacing was very slow and by the end, the whole thing was a touch tedious. What does entertain is Sylvain Chomet first short film The Old Lady and the Pigeons (1998) a film that won several awards including a BAFTA. It tells of a French policeman who watches a little old lady sitting on a bench in the park feeding a fat flock of pigeons. The policeman is starving so to fill his empty stomach, at the old ladies expense, he disguises himself as a pigeon. 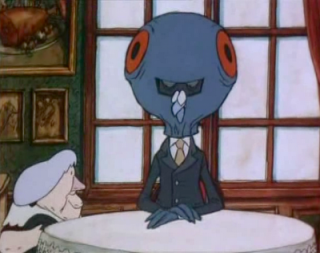 An enjoyable wee story, at 22 minutes, just the right length, it’s quite humorous, in fact the animation is much sharper and more colourful than Monday nights offering.